PESSTO SSDR2 has been published and is now available for download from the ESO Data Archive and the ESO Catalogue Facility. In its second year of operations, PESSTO has taken spectra of 395 distinct objects, bringing the overall total to 681 objects. During this second year 42 supernovae and 1 AGN were chosen as interesting science targets and scheduled for follow-up time series EFOSC2 optical spectroscopy, with the brightest also having SOFI spectra (the 1 AGN was not followed in detail). In total 798 EFOSC2 spectra have been released. These include 411 EFOSC2 spectra of our science targets which are chosen for detailed follow-up. 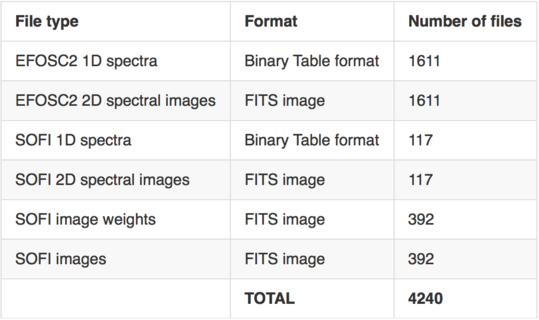 The other 387 EFOSC spectra are related to the 352 objects for which PESSTO took classification spectra (these were not followed in detail). Total number of science files released in various formats. Alongside the spectral and imaging data products we have now released two catalogues. The first is the PESSTO Transient Catalogue, a catalogue of 556 sources for which a meaningful spectral classification has been obtained up to the 1st March 2014. The catalogue includes spectral classifications and phases, host galaxy identifications, angular separations from the hosts and redshift information. The second catalogue is a catalogue of multi-epoch, multi-band photometry for all objects which PESSTO has completed a followup campaign. The release descriptions for both the data products and the transient catalogue can be found here and for the mutli-epoch photometry catalogue can be found here. Further information can be found in the ESO news archive. From detailed download instructions please read our wiki article. And cite Smartt et al. 2015 for reference to the PESSTO Survey.